Club Deise is a supporters club for the Waterford Senior Hurling team. They came to us with the need for a credit card payment system for three separate payment sections on their website. They were using PayPal but didn’t like the usability of the payment forms and also found it difficult to track payments in PayPal. We sat down with Club Deise and discussed the best options for their particular requirements. Together we agreed that credit card payments through stripe with a custom programmed solution by Irish Web HQ would be the best way forward for them. 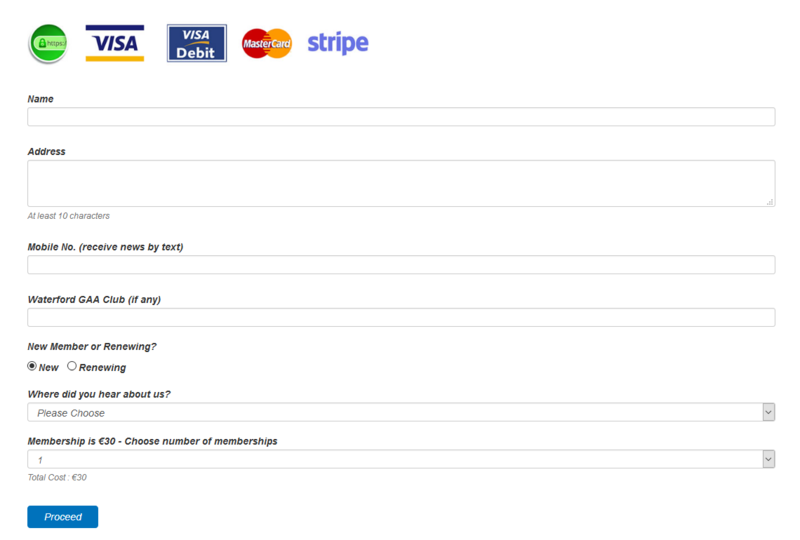 We completed the development of three payment forms which are working very successfully for Club Deise. The first payment form is for general members to sign up for a year’s membership. The second payment system allows website visitors to make a donation of their chosen amount with a credit card payment and quick check out. Finally the third payment system is for corporate donors to make a sponsorship payment club edition. In all cases we created payment forms that were easy to use, quick to checkout and immediately sent email notifications and receipts to the customer and to Club Deise admins. If you require a customer credit card payment solution contact us and we will be happy to discuss your needs.